Toyota always so something unique and bring something unique to the people and introduces the most amazing cars. They are giving tough competition to the rival company Honda but still, it’s more popular than any other in Pakistan. More than half the people in Pakistan are using Toyota cars and hence they launch new models. Previously, they have Launched Toyota Corolla Xli Manual in Pakistan which did not get enough popularity and have some cons. 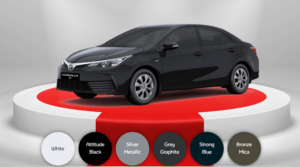 Therefore, they have launched the all-new Toyota Corolla Xli Automatic Car with improved quality and enriched features. The unique and amazing features of Toyota Corolla XLi Automatic Car are mentioned here. Review it and get your brand new car now. The brand new Corolla Xli has the most flexible Interior design which is comfortable yet pretty. Moreover, it powerful tilt and telescope steering wheel which is equipped with 3 scopes. The inner interior has soft touch padding at the rare areas. It has a most powerful transmission that is 4 speed AT super ECT. Furthermore, it has 5-speed manual transmissions. It has multiple display and power window control. The most attractive exterior of Corolla Xli has partial chrome plated front grille. Moreover, it has a new pumper design and powerful halogen headlamps as well as LED clearance lamp. Wheels are the heart of any car and it requires the same protection as engine requires. So, they have added 15 inches’ full wheel caps which protect the wheels as well as make it more beautiful. Additionally, it has body colored attractive mad flaps. For full security, it has side mirrors with turn signals and for the beauty, it has chrome rare garnish. When you apply the brakes suddenly, the ABS helps to prevent the wheel locks. For excellent braking power and car safety, EBD feature has been added. Furthermore, a brake assist feature has been added to assist the driver for brakes. This is an anti-safety theft feature which will ensure the safety of your car. It prevents the use of any other key used to open or start the car. Whenever a person will enter the key into the car, it sends the signal to the car and if the key matches to the original, then the car will start. Otherwise, another key usage for starting the car will never work. This amazing car has ISOFIX feature to attach the child seat in the car. You can perfectly attach the child seat which will connect with the body of the car. The Car is available in the varied colors which are eye-catching. The Price of this amazing Car is Arnoud 14,44000 PKR.